My school has had Doug Scheer as a regular for years. The staff and kids love to watch him perform and the messages from his various programs are tailored for maximum enjoyment and impact. I would recommend him to anyone interested in a program that is engaging and fun for all. 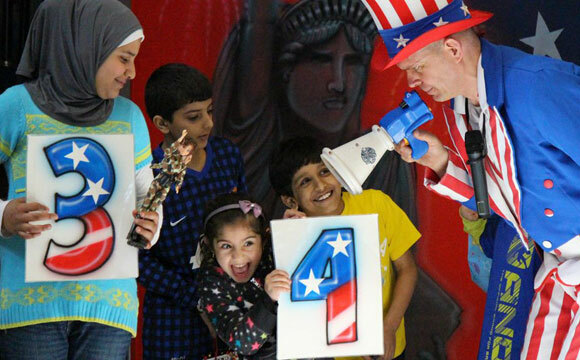 Doug Scheer has given thousands of Southgate students the joy of assembly shows over the last 10 years. He constantly refines his assembly shows to be engaging, thought provoking, and relevant. The students always ask, “when is that assembly guy coming back”? Staff are equally enthusiastic about his return. He could rename his act as “Scheer Enjoyment”! 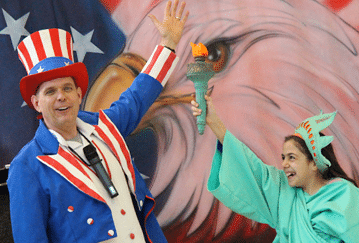 Social studies is made hilarious in this 45 minute assembly show for elementary kids. Don’t you love Google? If you’re reading this you probably searched for "fan-edu-terical" assembly show (that’s fantastic, educational and hysterical combined together, but you knew that). 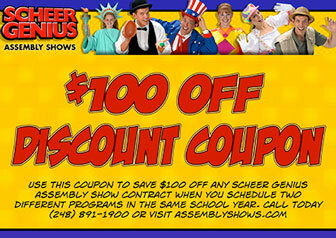 Or maybe you searched for great shows for schools, or best assembly show, or fun school shows. It doesn’t really matter. Google just presented you with the best result. "Fan-edu-terical" assembly shows. 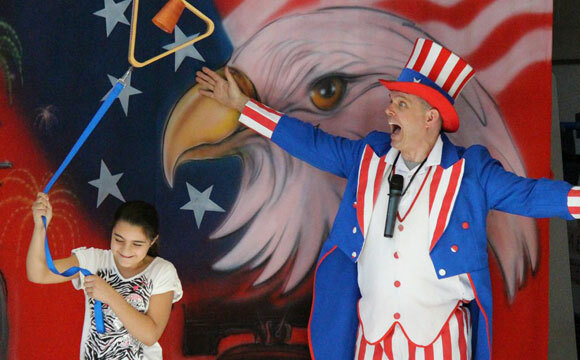 Add to that spectacular, engaging, and fun and you found Uncle Sam’s Comedy Jam Show. 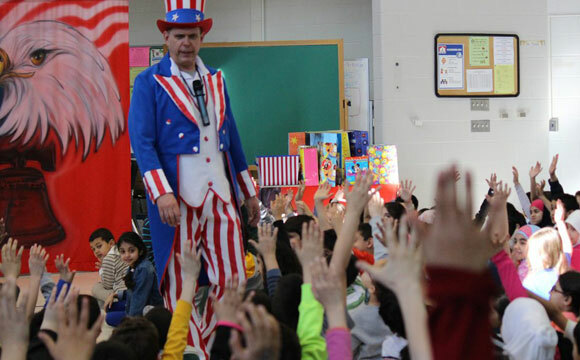 It’s my American history program for elementary school assembly shows. Ready to learn about it? Lets go! The Constitution and Bill of Rights becomes much easier to understand, even for primary students! 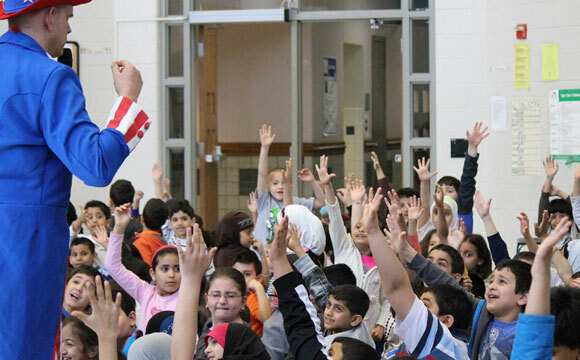 As an assembly performer for over 30 years, I know how to bore kids. I really do. That’s right. I know what makes them roll their eyes, yawn, and daydream about which episode of SpongeBob SquarePants is their favorite. That’s the kind of stuff every great school show presenter needs to know to be successful. And when it comes to American History lessons, every teacher can get kids’ eyes to glaze over in five seconds. But I also know how to make them laugh, beg for more and pray that they get called upon to help out on stage. 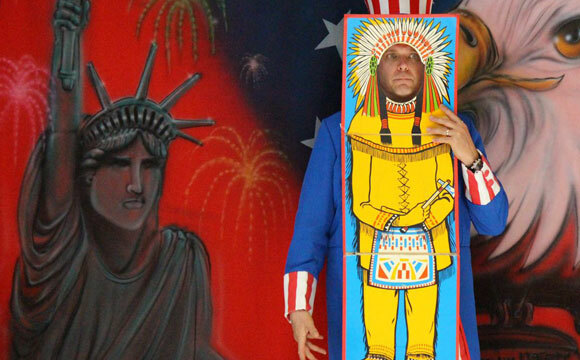 I turn the Bill of Rights into birthday presents that kids get to “take” home. The Constitution becomes a “dangerous” stunt that guarantees your students will remember that the three branches of our government are balanced and share their powers equally. Ever get splashed with with a few drops of Powerade? Some kids will when they learn about popular sovereignty. You’ll watch them scream with excitement and your teachers will praise the brilliance of these lessons. Teachers breathe a huge sigh of relief. 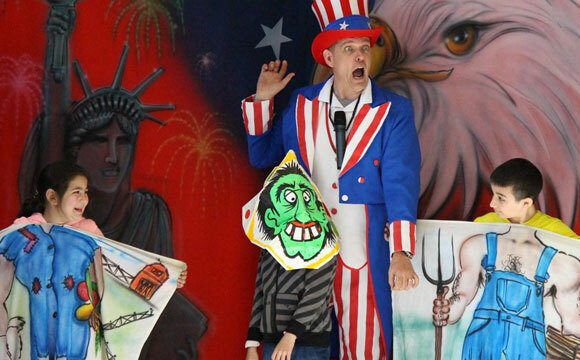 Teachers love Uncle Sam’s Comedy Jam because schools need to fulfill the federal requirements of teaching the Constitution every year. This show does that "fan-edu-terically". Constitution Day is September 17th and the two weeks surrounding that date are always sold out so you need to call early if you want a date then. I’ll provide preview and review sheets the teachers can use to fulfill their requirements regardless of the date you schedule. 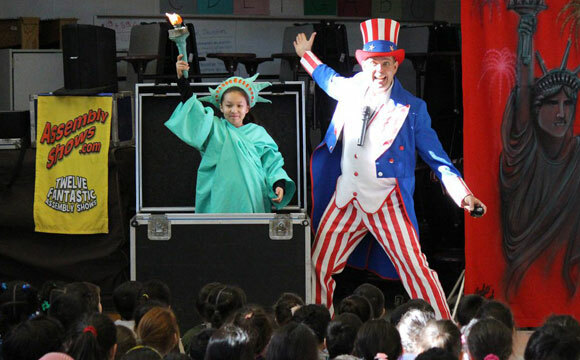 But this assembly show is also available anytime of the year to support classroom lessons and is perfect for election years, Presidents’ Day, Veterans’ Day, and Memorial Day celebrations in school. There’s a hunk of dried toothpaste at the bottom of your sink. 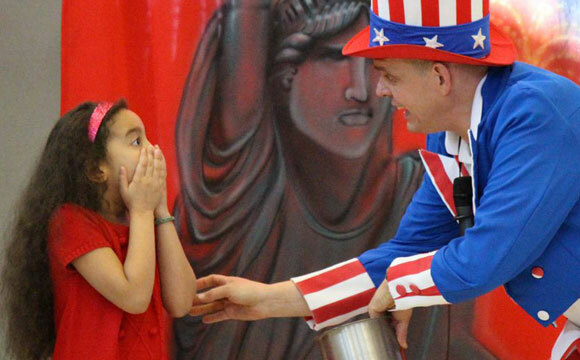 Give you teachers a gift and make their jobs easier by scheduling this American History assembly show for your elementary school. 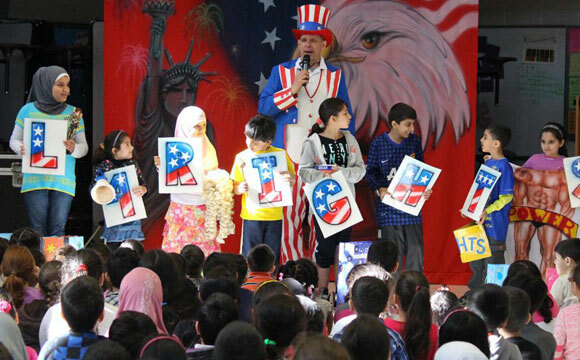 I promise your teachers will thank you and your students, from kindergarten through sixth grade, will have a great time. Ready for an assembly show that’s "fan-edu-terical"? Let’s coordinate schedules. 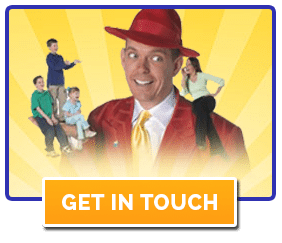 Give me a call today (248) 891-1900 or request even more information by filling out our contact form and I’ll rush info back to you immediately.